Wild Orchid Climbing Rope Dog Leash. Mountain climbing rope is light weight, strong, durable, and available in a variety of colors. It’s perfect for building custom dog leashes. When equipped with marine grade 316 stainless steel clips, customized rope clamps, and welded stainless steel O rings, you have an exceptional well designed dog leash. A dog leash is a simple design. That doesn’t mean it needs to be designed with simple materials. Unlike pet stores, we build our dog leashes as if we are building a life line for your biggest and strongest dogs. Strength and safety are important. 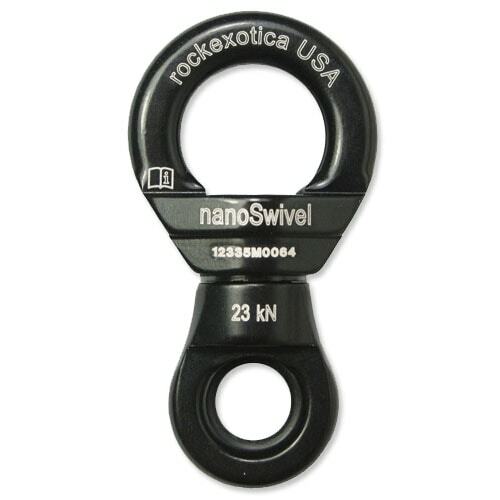 For even more strength, a light weight locking carabiner or carabiner and nanoSwivel combination are available. The design of all of our custom dog leashes make use of the same materials used in rock and mountain climbing. These materials are tested and used by the best climbers and mountain rescue personnel. We see no reason why the same quality rope and carabiners should not be used when building custom dog leashes. Our Wild Orchid dog leash is strong and comfortable to hold and perfectly suited for Med to XL dogs. Our four foot dog leads are a popular length, and a good choice for walking most dogs. The longer six foot leash works well for basic obedience training of puppies, and young dogs. It’s usually recommended by trainers. Shorter traffic or control leads are also available. If we don’t have the length you want listed in the drop down menu, please contact us. An optional 3.5 inch black forged aluminum locking carabiner is also available. The carabiners we use are the real thing, and CE rated. These are smaller and lighter than other carabiners making them suitable for medium to large dogs when the added strength, and safety of a carabiner is required. Keep in mind that unlike stainless steel clips, carabiners don’t swivel 360°. If your dog likes to bounce all over the place a carabiner may not be the best choice. If you don’t see the length you want in the drop down menu, contact us. If we can, we’re happy to add custom lengths to the website just for you. 4ft Walking Leash built with 10mm Climbing Rope and Stainless Steel Clip. • Snap Hook Material: 3.5 inch/89mm – Marine Grade Stainless Steel. • Optional Carabiner: 3.5 inch/89mm Black Aluminum Forged with Locking Screw Gate. It's perfect! The materials are high quality y very durable. Thank you so much.